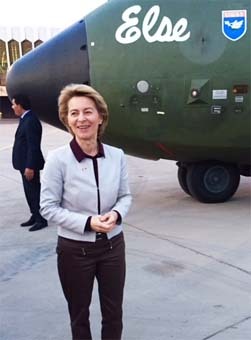 We accompanied Germanys Minister of Defence during her latest visit to Iraq this weekend. Taking off from Berlin with a government-plane heading to Amman (Jordan), she had to transfer into the 1970. build Trans-Atlantic, called „Else“, continuing to Bagdad International Airport on last Friday night. There, the group of Press-members got devided in two. All the print journalists had to continue their journey to Arbil and only four members, mostly picture guys, stayed in Bagdad to cover the political programm that was planned for on Saturday. Major Topic: the joint engagement towards Daesh and Germanys further role in the Nato training program. There are thoughts of extending the „Core-Team“ at Bagdads Nato-base (NTCB-I). Agenda: next to her counterpart she also met: president „Fuad Massum“ and primeminister „Haider al-Abadi“. Althoug „Ursula von der Leyen“ is actual a „acting-minister“, she is hoping to help settling the Iraq / Kurdish dispute, dued to the kurdisch „referendum of independancy“, led by president ,“Massud Barzani“, late, last year. Covering the Bagdad meetings, we, the press, had a solid promise of a two-hours working-gap at the german-embassee in Bagdad. Well…2 hours became 1, and the wifi was not as good as been told, so you can imagine how we guys were rotating getting our jobs done! Anyway our mission continued and we all arrived a bit wrecked but content at the airport in the evening where „Else“ took us to an extremly silent Arbil-International Airport. According to the problems between the Iraqi dispute, Bagdad recently ordered an embargo for all airlines visiting Arbil, so the old-lady-Else was the only plane visiting that airport that night. Knowing this fascillity made it very awkward. When Bagdad was very pleasantly, workwise, Arbil showed his own, known, face…. suddenly we were confrontatet with 15 till 20 local newsstations.So let the runnin begin. ( nothing badly saith about our kurdisch colleaugues, but, it ment, stressfull working). After all, …. everything was accomplished and broadcasted. This entry was tagged Amman, Arbil, ARD, Bagdad, Barzani, Core-Team, DAESH, Erbil, Fuad Massum, Haider al-Abadi, Irak, ISIL, ISIS, Jordan, Jordanien, Massud Barsani, NATO, NTCB-I, referendum of independancy, Tagesschau, Tagesthemen, Trans-Atlantic, Ursula von der Leyen. Bookmark the permalink.